My name is TOHARUDIN BIN ABD RASID. 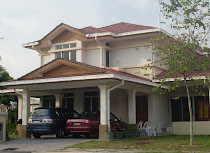 I was born on 22nd November 1959 in Kampung Parit Lapis Mahang, Senggarang, Batu Pahat, Johor (in English ‘Johore’). Toharudin (supposed to be Toharuddin) is a combination of Arabic words ‘toharu (toharoh)’ and ‘addin’ mean ‘religious purity’. 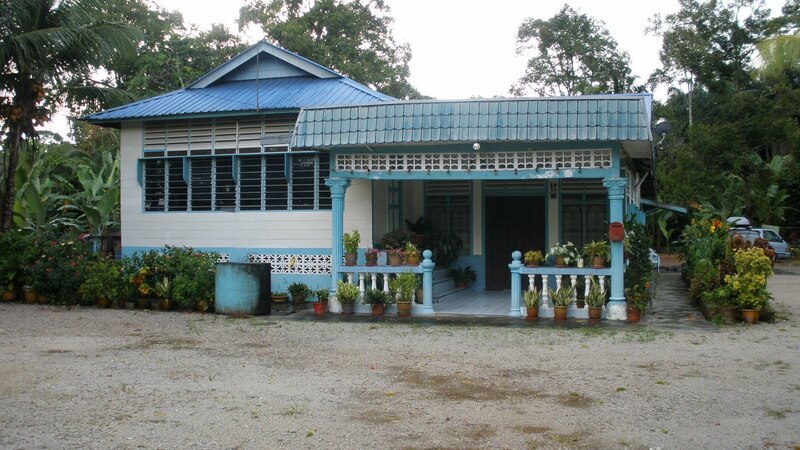 Parit Lapis Mahang (see parit) is one of the kampongs along 20km Jalan Parit Botak. A small road across from Jalan Ayer Hitam-Batu Pahat and Jalan Pontian-Batu Pahat. You can read more about my kampong in my special title 'My Kampong' in this blog. My father’s name is Abdul Rasid @ Abdul Rashid @ Haji Abdul Aziz bin Haji Tahir @ Isa bin Ibrahim. He was born in 1927. My mother’s name is Umi Kelsom binti Haji Mustapha. She was born in 1935. 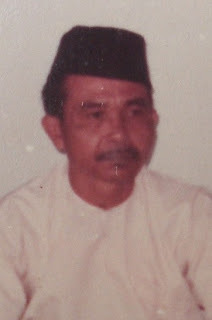 My grandfather (Haji Tahir) and Haji Mustapha were born in Middle Java, Indonesia and migrated to Malaya before the World War I. Haji Tahir was born in Belora, Middle Jawa in 18xx (he died in 1976) married to Hajjah Manisah binti Shafie (she died in 1992). 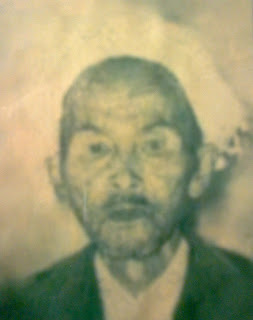 My another grandfather, Haji Mustapha bin Pajoyo was also born in Jawa and he died between 1945 – 1948, killed by the Communist or 'Bintang Tiga' during the ‘Emergency Period’ immediately after the end of Japanese Occupation) married to Hajjah Suminah binti Kasan @ Hassan (she died in 1995). “Semoga Allah mencucuri rahmat ke atas roh kesemua nenda-nendaku yang telah meninggal dunia). Note 1: I was told by my grand-mother that my grandfather (Hj Mustapha) was assaulted and killed (either shot or stabbed) by the group of Chinese terrorist (Bintang Tiga) infront of his house (in my kampong). According to my mother, during the tragedy, she was between 10 to 13 years and at that time, everybody was in fear (to the Bintang Tiga). So, the body (jenazah) was not carried to the kampong's cemetery (about 3km from the house). So,they (small group of villagers) buried him nearby to the house at the simplest manner. The grave is about 50 meters from my parent's house now. My father married to my mother sometimes in 1949 or 1950 and issued with 8 children, 6 boys and 2 girls and one adopted son. 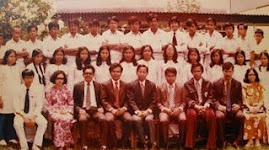 Md Jahrom @ Long @ Om (Haji) - 1951, he married to Sharifah Zainah binti Syed Lani (Hajjah) in 1975 and blessed with 4 children). Siti Rahimah @ Ngah @ Im (Hajjah) - 1954. She married to Hamzah bin Haji Yusof (Haji and almarhum, died in 2007) and blessed with 8 children. Khamim @ Amim (Haji) - 1957. He married to Badariah binti Samin (Hajjah) and blessed with 6 children). me (see topic: My Marriage). Nor Adzim @ Ajim - 1963. He married to Zaharah binti Abd Rahman (from Pulau Indah, Klang) and blessed with 7 children. Rakhiman @ Man (Haji) - 1965. 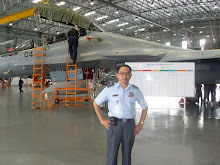 He married (first) with Siti Salmah binti Jahis (1994) and blessed with 4 children. They divorced in 2005 and then he married to Jamilah (from Kemaman) in 2008 and blessed with a children. Khairiah @ Yah (Hajjah) - 1968. She married to Safingi bin Sulaiman in 1992 and blessed with 5 children. 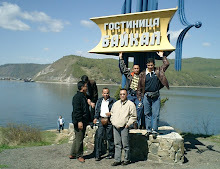 Aminin @ Minin @ Min - 1971. 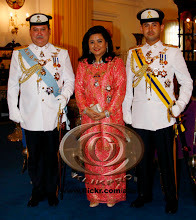 He married with Rezza Mardeanna binti Mohd Rosdi in 2008. The detail of my siblings can be found in another blog title 'My Sibling". 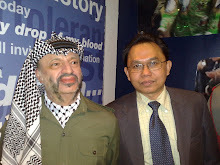 Amir bin Agos (born: 1958) is the son of one of my auntie from my mother's side (Siti Amirah binti Mustapha @ Lek Siti). He joined my family in 1968 due to some 'long story family dispute'. I should not tell more about the story here because it touched 'somebody' that already passed away. We (the whole family) treated him 100% as part of our family. As a normal 'kampong boy', I was grown up within the typical kampong environment. Our (boys) routine activities were driven by the environment such as ground, trees, birds, fruits, water (river and pond) and etc. Normally we moved in group, 3-5 boys per group to go for fishing, 'melastik burung' (shoot the birds by using catapult, and the bullets were normally unripe coffee bean or small gravels), 'membaling buah mangga (kat kebun orang punya laaa)', or 'mandi parit'. If you see the 'parit' (drain) today, you could not imagine how we all can 'mandi' inside there, what was the product after taking the bath. Actually we all were not 'mandi' but 'berkubang' (wallowing). Other games we played were 'main tarik upeh, main gasing (top), main dilu'-dilu'an (police & thief), 'main lastik getah (catapult)', main ogok ilit (kenda-kendi)' and main galah. 'Upeh' is a Javanese word of dry frond from a betel palm tree. For the villagers, 'upeh' was usable. Before 'tupperware' was introduced to the remote kampong areas, they used 'upeh' to wrap food (Malay = bekal) for the school children (Jawa = bontrot). They also used it as a packing material for 'dodol' (Jawa = jenang) and 'getok ubi'. 'Upeh' was also used a game material to entertain our small brother/sister as alternative to 'basikal roda tiga'. Sometimes we (children) performed a competition of 'lumba tarik upeh'. How the 'upeh' was used, please see the picture below. 'Main galah' was famous during the fasting month. The playing time was after 'sembahyang terawikh' (about 1030 pm) and the place was at the 'surau's' compound. We divided into two team of 4 to 6. Normally we played for one or two hours, but sometimes get carried away we played until 1.30am or until my father came with rattan or more lucky, he use the 'kayu tiang main galah' to slash us. However my father will only slash me and my brother, not other boys/players. The others will normally get disappeared fast. Ending up the games with fighting (struggling) also happened. This happened when one of the players or team was cheating in the games or hitting the rival (while getting through the distance) to hard. However, tomorrow night we will forget the dispute and play again. Another night games was 'main sembunyi-sembunyi' or 'dilu'-dilu'an' (police and thief). 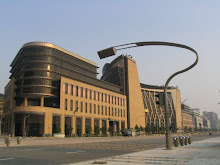 In this games, we would specify the boundary or limitation, so the players could not hide as they like. Sometimes, if we failed to find out, everybody will get worry and start to think nonsense, that was 'dia kena sembunyikan jin' (gin/genie). Our belief was the Muslim gins were staying in the mosque or 'surau'. We believed that the gins will cover our friend and invisible from searcher. Today, strangers like to sleep inside the mosque or surau. But those days, sleep in the mosque was something to be avoided. If you are 'unlucky' at the midnight, the gins will lift you and put you beside the well or in front the toilet. One more popular kampong game was 'kenda-kendi' but we called (in Jawa) 'main ogok-ilit'. In simple language, this mean 'arse thrust'. hahaha. I will find how to explain to you of how to play 'ogok-ilit'. Kakang or Kang (abang)- your elder brother or the son of your elder uncle/aunt. 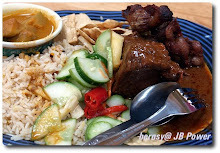 Kakak or Kak or Bakyu (kakak)- your elder sister or the sister of your elder uncle/aunt. Wak (Pak Cik tua)- your elder brother/sister to your mother or father (uncle/aunt). Lek (Pak Cik muda) - your younger brother/sister to your mother or father (uncle/aunt). 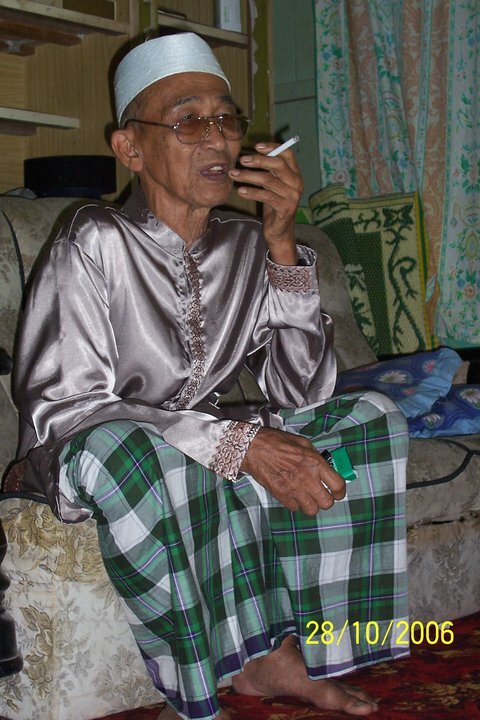 Embah (datuk or atok)- your male grandfather. 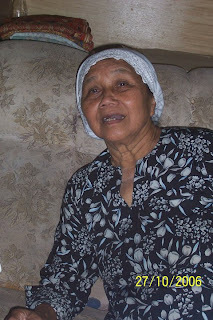 Nyai (nenek)- your female grandmother (sometime also called Embah)-in Perak they called 'opah'. Buyut (moyang) - your grand grand father. Putu (cucu) - your grand grand children. My father have only 3 siblings. My father is the oldest. Abdul Manap (Haji Abdul Shukor) we called him Lek Shukur. 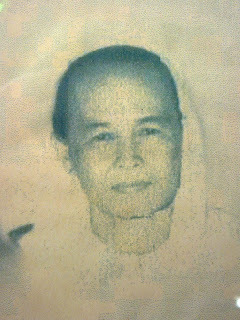 He married Hajjah Halimah binti Haji Jabar. Lek Shukur passed away in 1986 and left 5 children Shamsiah, Norkamal (building engineer), Mohd Rohan (architect), Marsilah, Faradibah and Mohd Hamidy. The youngest brother is Haji Razikan (pensioned teacher in JB). He married to Hajjah Hafizah binti Hj Jaafar and blessed with 2 children, Raha and Raudzah. Allahyarham Hj Shukur and family: from left Shamsiah, Marsila, Faradibah and Rohan. Hamidy is carried by his mother (Halimah)- pic in 1980 or 81. Kamal was not in the pic. 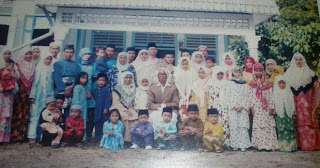 Wak Yen (2010- still alive) married to Rokiah bt Sujak (died of cancer in early 2000th) and issued with 8 children namely; Zainal (Gering), Zainah, Mustapha, Sujak, Zubaidah, Zaidah, Zawiah and Zulkifli. Wak Sam (2010- still alive) married to Mariam bt Abdullah (known as Wak Epol) and blessed with four girls; Alene Noraziah (she died in 2003 of cancer in her early 50s), Normah (married to Muhammad Abdullah- now settled down at Semabok, Melaka), Arene Norashidah @ Wynn (now stying in Bangi) and Anne Zuraidah (married with Dzaharudin and now resident in Bangi). Wak Epol was died in 1995 at her 58. 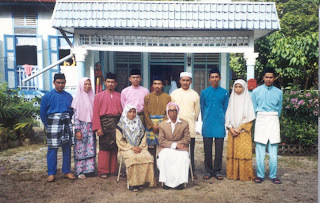 Wak Besah married first with Radiban @ Rakiban (died) and granted with 10 children; Hanipah (Kak Pah), Zainab (Kak Nab), Maarof (Kang Jikan), Khadijah (Kak Jah), Kak Yah, Sairi (Kang Ri), Junainah (Kak Nah), Jumali (Kang Ju), Hayati (Kak Yati) and Huzaimah. They divorced at late 50s and both also married for second time. Wak Besah later married to Tumpang bin Karsan (Ketua Kampong Spg 6). 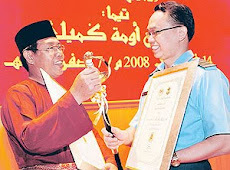 Wak Non married with Hj Kandar bin Mat Raji (he passed away in Jasin sometime in 2006). They were blessed with 8 children; Norhadi (Kang Nor), Sulasteri (Kak Su), Supian (Kang Yan), Ahadiah (Kak Mi), Asmah (Kak Mah), Norsiah (she died at young) and Nor Rafidah (Kak Pi). 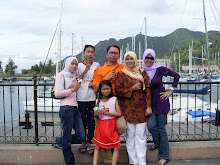 Lek Siti married with Agos (divorced) and issued with a son, Amir (later become my adopted brother since his age of 9). 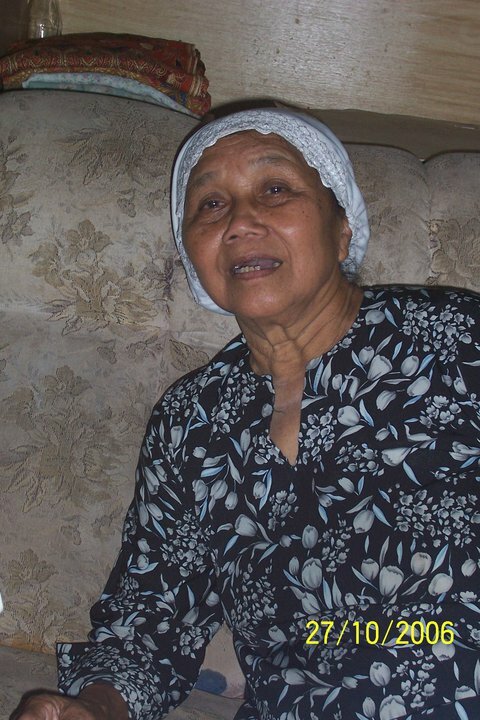 Lek Siti later married to Rosad and having issues with 3 sons; Mohd Sukaini and Mohd Isa. Another one died at young. 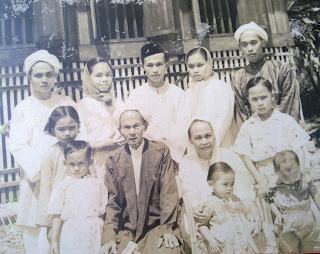 from left: Normah, Wak Epol, Anne, Arwah Aziah, Wak Sham and Wynn.